Update: Hostgator has extended its “Small Business Saturday” sale to include Sunday as well. So don’t miss out! Every year, Hostgator comes out with a MASSIVE coupon code list for Black Friday, and 2018 is no exception. This year, they started adding their codes on the 13th of November – a full 12 days in advance. Maximum Hostgator Discount of 70% – Not 80%! 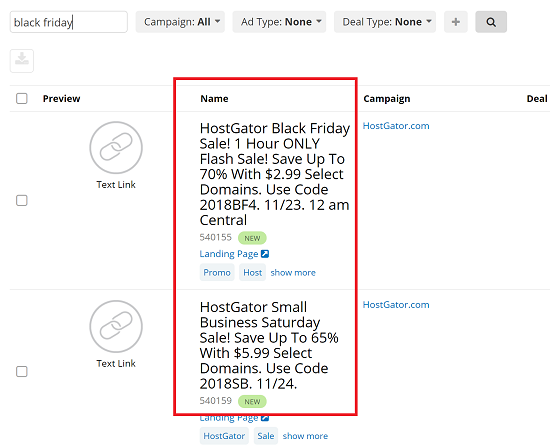 A lot of websites are giving you outdated data about Hostgator’s 2018 Black Friday deals. They claim that you can get 80% off. This is NOT TRUE! The maximum discount for this year is 70%. These coupons are available THROUGHOUT the days specified. The discounts they provide will apply only on these days. However, the catch is that they also give lower discounts. If you look at the table above, you’ll see that the maximum discount for the global coupons is 65%. Which brings us to the HOURLY coupon code list. THIS is where the real savings happen. These coupon codes are designated with a number at the end – 1, 2, 3 etc.. They run for one hour only. Starting at the time indicated in the table. Remember, these are CST times. So don’t forget that and try and claim them in other time zone! This makes for a grand total of 17 coupons for Hostgator’s entire 2018 Black Friday sale including Small Business Saturday and Cyber Monday. They’ve almost made a game out of the whole thing! That’s a pretty damn low price – as low as anything you get on the special holiday events. The only catch is that you can’t lock in these savings for more than 1 year. If you want the best 3-year discount, then Black Friday is the time to do it. So mark it on your calendar and get ready to shop! !